Good morning polished world! How are you all doing on this lovely Sunday? I meant to have this post up yesterday, but work has been abnormally crazy. I feel that all my posts start out this way, but this week truly is an exception. Maybe next week it will slow down? Who knows. 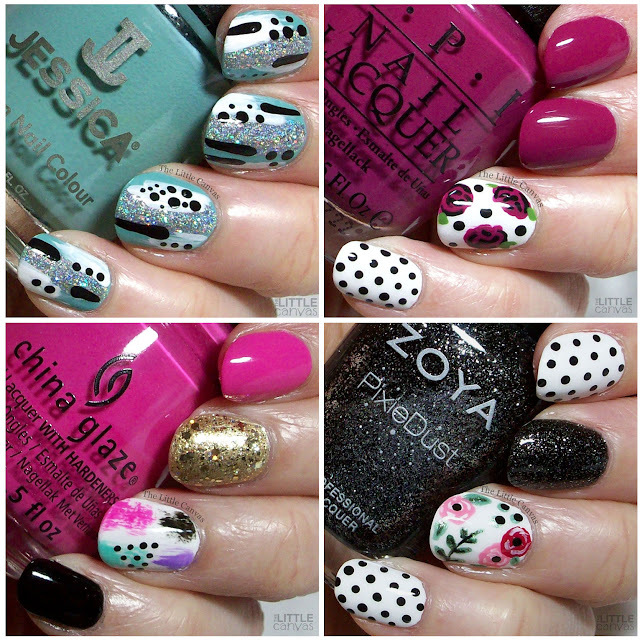 Well, March isn't over yet, so technically I'm on time sharing my Monthly Mani Favs for March! Can you believe April is right around the corner? I feel like March just began. I feel most of my days are a blur. Regardless, March had a lot of good manicures, it was hard for me to pick! I didn't really do many St. Patrick's Day designs and looking back I kind of wish I did more. The One Inspired by JasmineNobleNails - The first of many abstract manicures that are coming up on the blog. Jasmine created this design and I absolutely fell in love due to the color combination. Her design was better because she has longer nails, but I still think it turned out well. The One With the Mani Swap with NailsBySammie_ - I took to my Instagram Story and asked if anyone would be interested in doing a ManiSwap and NailsBySammie_ was quick to answer. She has some of the best manicures on her page, so you really should go check her out. I love how she uses little accent rings. I loved her rose manicure, so I had to do it for my mani swap. Plus, I was able to use Spare Me A French Quarter which is a lovely shade I forgot I owned. The One With the Abstract China Glaze Manicure - My favorite of the month. Simple design which looked like it took forever to create. Loved the gold accent with the fun neons. Part of me wonders what it would look like with a silver accent....so I might be re-creating it real soon. The One With the Floral Manicure Inspired By Srg.Nails - I had a lot of manicures this month inspired by fellow nail artists. Might be because I went on a mass unfollow of dead accounts and followed a lot of new, talented artists. I need to become more active on Instagram more often so I can be inspired by more lovelies. This manicure was absolutely lovely and I was really impressed with my nail art. What do you think? Which was your favorite? I need to start thinking about some Easter manicures!! !